This must be my month of basil and tomato recipes. I got the idea of this recipe from William Sonoma. I was trying to figure out how to use up all my basil and tomatoes from my garden. 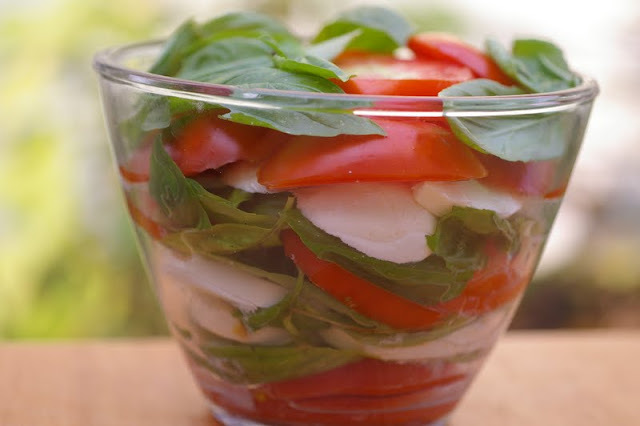 This classic Italian salad fits the bill. I love it with everything. Maybe because it goes with everything. It is a versatile recipe that is very easy to make. I want to say this makes a great Lent recipe, but I don’t ever eat this during Lent. You see, tomatoes are not ripe when lent comes around and I only eat this salad during the summer. When it is at its freshest. It is when tomatoes are ripe and plentiful. No hot house tomatoes in this recipe. So if you don’t have a garden, maybe a neighbor is nice enough to give you some home grown tomatoes, Either way go out and get some fresh mozzarella and some basil. 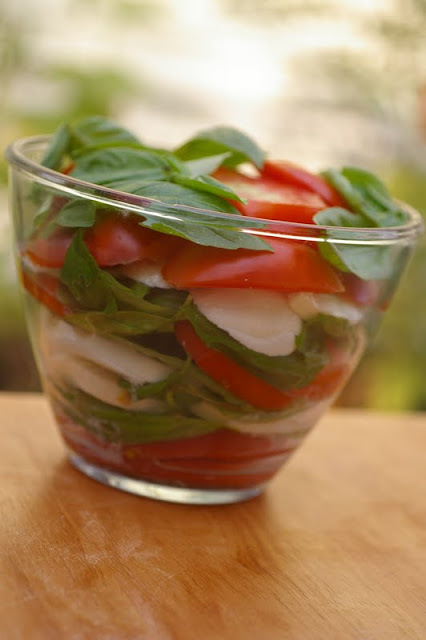 Slice the mozzarella and tomatoes into thin slices. In a clear bowl layer a few tomatoes on the bottom. Sprinkle a few pinches of salt on top followed by a few grinds of pepper. Layer a few slices of Mozzarella cheese over top of the tomatoes. Drizzle olive oil over top of the mozzarella. Then layer basil leaves over top of the mozzarella slices. Then start all over with more tomatoes, salt, pepper, mozzarella, olive oil and basil leaves. Continue until everything is in the bowl. End with fresh basil leaves. As an Italian girl, I Love caprese salads! Yours looks great! Veronica, that is such a cute way of presenting a Caprese – really lovely! I wish I could reach in your screen and grab one of those slices of tomato. Ok, no, that’s not true. I’ll take the whole bowl. I love and adore all the ingredients in here. Thanks for sharing a summer favorite. This is absolutely beautiful. I love how you have it layered. I so love this combination, perfect! PS – I have those bowls…LOVE them! You made this into ART! I Love the look, as well as the taste! We love this salad and eat it almost every day when the tomatoes are in. It’s so light and a perfect compliment to any meal, especially in the summer. A little drizzle of olive oil and a splash of balsamic… delizioso! That is so pretty! One of the best presented caprese salads I’ve seen! Yum! I love this combo. Love your way of layering it in a glass bowl!